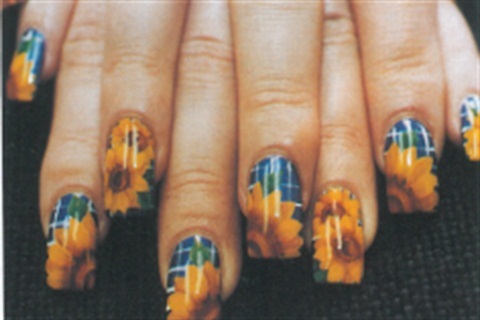 In February, NAILS offered readers a chance to vote for their favourite nail art designs of 1996. Now, all the votes are in, and we're pleased to resent the winning designs and the talented artists who created them. 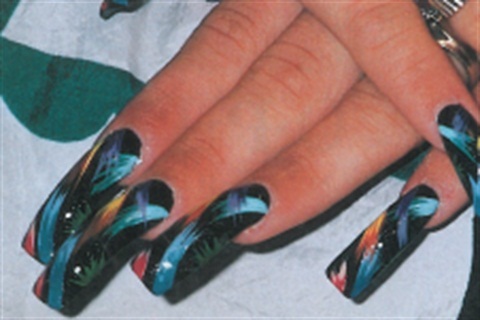 Winners will receive certificates of excellence in the field of nail artistry. Kobayashi airbrushed each nail black then added two silver stripes. 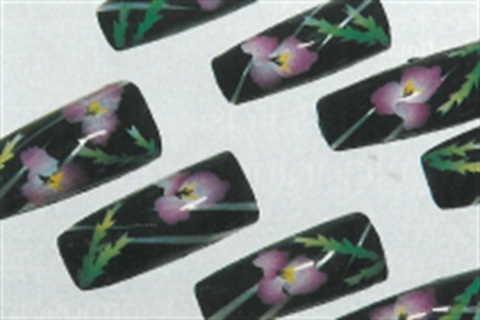 Using three overlapping petal-shaped stencils, she air-brushed the flower design in white, then violet. She air-brushed the centers with yellow, then handpainted black accents. Finally she used two leaf-shaped stencils and white and green paints to create the greenery. Cassell applied a coat of French pink polish to the nails, then airbrushed the tips white. She handpainted the flowers by double-loading a detail brush with purple and white paints. She used a striping brush to paint the stems and a detail brush to paint the leaves and the baby’s breath. Schultes’ handpainted sunflower design offers clients a ray of sunshine any time of year The blue plaid background provides a bold contrast to the rich yellows and umbers of the flowers. Komporlis airbrushed black white, and violet swirls on a base of bronze polish. She added rhinestones and gold glitter to make the design nearly sparkle. Ryan used a black background to set off the vivid colours of this handpainted design, She used graduated light-to-dark paint “flashes” to create a dramatic effect on the model’s natural nails.